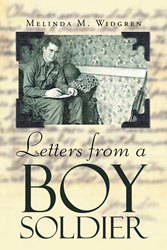 Recent release “Letters from a Boy Soldier” from Page Publishing author Melinda M. Widgren is an interesting set of old letters that Warren, a young boy who was inducted in the army at the age of eighteen, sent to his family for them to have glimpses of his life away from them. Melinda M. Widgren, a North Idaho-based granddaughter of a soldier, has completed her new book “Letters from a Boy Soldier”: an inspiring collection of letters showing the life of Warren, her grandfather, as he helps in defending the freedom of America by joining the army, even if it means being far from loved ones. Published by New York City-based Page Publishing, Melinda M. Widgren’s poignant book uses her Grandpa Warren’s letters to display his bravery and the kind of sacrifices he makes as he leaves home to become a soldier. He is indeed presented as a person who always tries his best to keep in touch with his family even in the middle of a war. Readers who wish to experience this fascinating work can purchase “Letters from a Boy Soldier” at bookstores everywhere, or online at the Apple iTunes store, Amazon, Google Play, Kobo or Barnes and Noble.